Nothing beats holding your new shiny iPhone for the very first time. Congratulations on owning one of Apple’s most prestigious smartphones! The premium material, state-of-the-art components, big and responsive display altogether complete the experience. Now it’s time to get accessories that are worthy of your new iPhone. 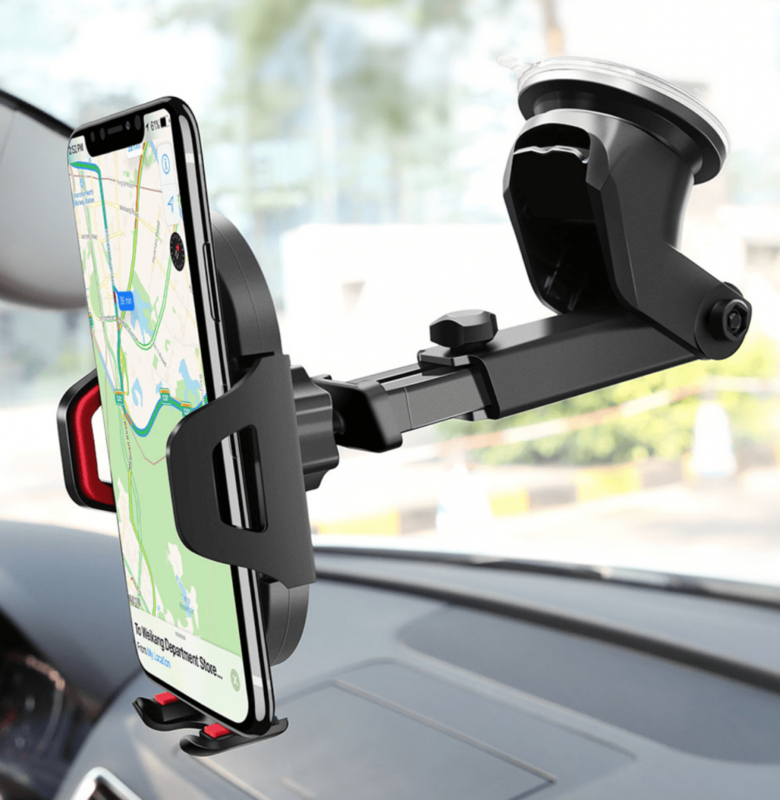 We list the best iPhone Xs, iPhone XR, and iPhone Xs Max car mounts that offer superior quality. These mounts come with free shipping, so feel free to take your pick among our top choices. The Universal Magnetic Car Mount is a no-nonsense holder that ticks all the right boxes. 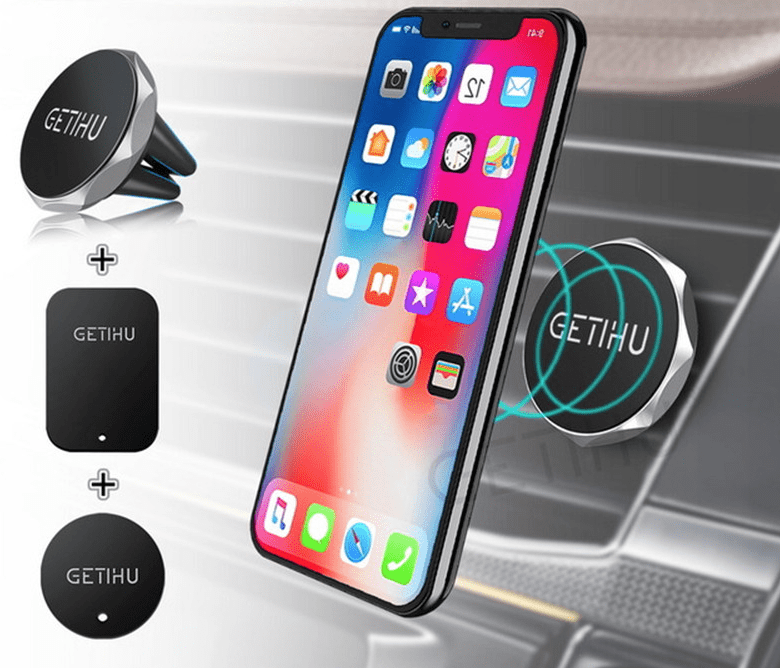 The strong magnet and the 360-degree feature makes it a must-have for discerning users who want to use their new iPhone with utmost comfort and style. Choose from an array of classic colors ranging from Black, Silver, and Gold. 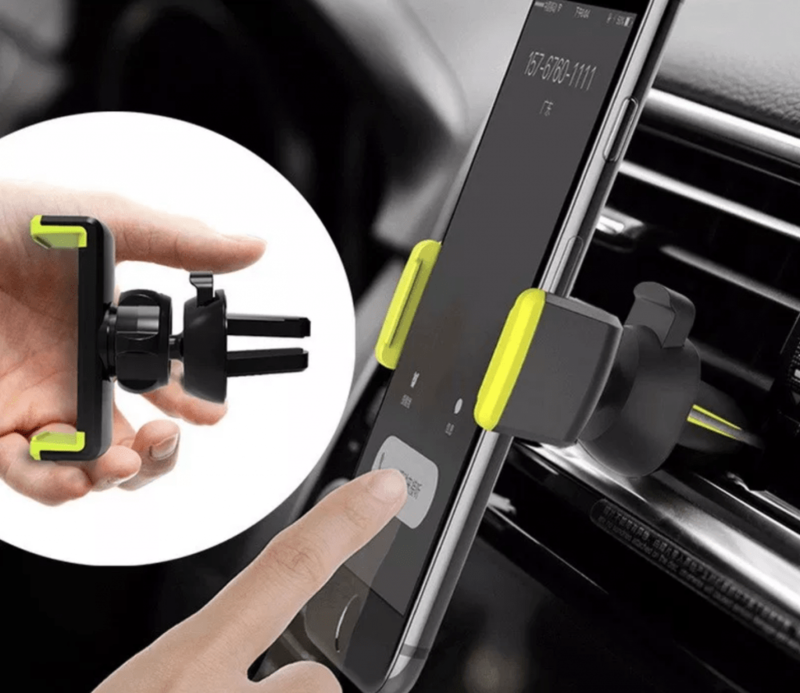 Powerful magnets keep your iPhone attached to the dashboard for hands-free operation. The magnetic mount comes with a two-size vent clip that can be used on a wide range of car air vents. Installation is easy- just attach the protective film, wipe the dashboard surface for a minute or two, then attach the mount to the dashboard. The closed magnetic field technology doesn’t interfere with your iPhone’s cell or Wi-Fi signal at all. Removing your phone is a snap. The mount keeps your iPhone safe and steady even in bumpy roads. Get total hands-free use out of this nifty accessory. Need a tough, yet stylish iPhone mount to place your device in while you’re navigating the road? The 360 Degree Air Vent Car Mount is the perfect item. It works on newer iPhone models, including the Xs Max, Xr and Xs and on phones that are between 3.5 to 6.5 inches. For one, this car mount may be attached on virtually any air vent on most vehicle models. The accent colors act as an eye-catcher that adds a nice touch to a monotone dashboard. You can choose from Gray, Green, Blue or Black depending on your preference. Protection for your new iPhone comes in the form of a PVC and ABS hybrid material, designed to hold your mobile device securely and preventing it from untimely drops. You get full 360 degree rotation and angle placement, thanks to the sturdy ball joint. One-handed operation is a cinch with this product in your dashboard. Go completely wireless and hands-free without the tangle of cables with the Wireless Charger Air Vent Car Mount. It acts as a mount and charges your phone at the same time, eliminating the need to bring a power bank or a charging cable. 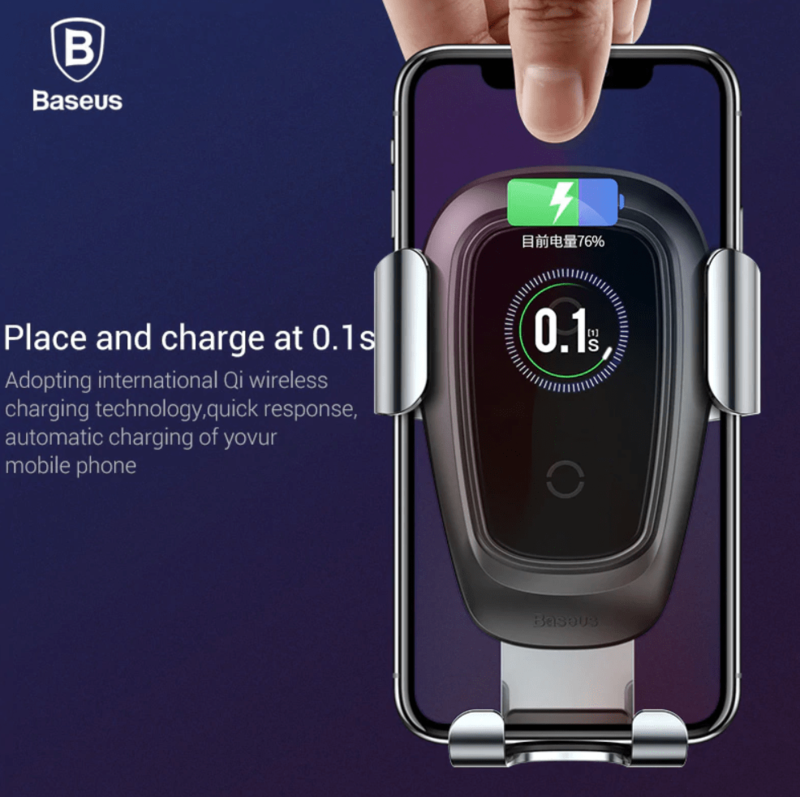 The integrated Qi wireless charging technology instantly charges your device automatically. The intelligent, quick charge feature controls temperature and prevents overheating. Materials used are similar to that of Apple devices- premium glass panel and an alloy clamping arm holds your iPhone securely without causing any scratch or damage. The clip works on almost any kind of car vent while the gravity interlock technology prevents shocks and bumps. Best of all, you won’t have to remove the protective case of your new iPhone to have it mounted on your car’s dashboard. The universal ball joint gives you the ultimate freedom to position your iPhone at any angle. The Windshield Car Mount is for individuals who want an iPhone holder that works on various surfaces. You can stick it on any flat, level ground easily- just push the cup down, press the lock and voila! a hands-free experience anytime, anywhere. You can put it on windows, on the co-pilot seat, the centre dash panel and even attach it on your office or work table. Its portable aspect makes it versatile and useful in a number of daily scenarios. What’s more, you can adjust to any angle with the 270 degree, 3.8 to 5.8 extendable arm and the 360 degree rotating ball. With this iPhone mount, you’ll be able to get the best position with just a few adjustments. The adjustable boom arm and the locking mechanism are in black, but you can choose the accent color to be gray or red. The durable construction means you’ll be using this iPhone car mount for a long, long time! It’s small, unobtrusive and functions as well as any iPhone car mount you might have. 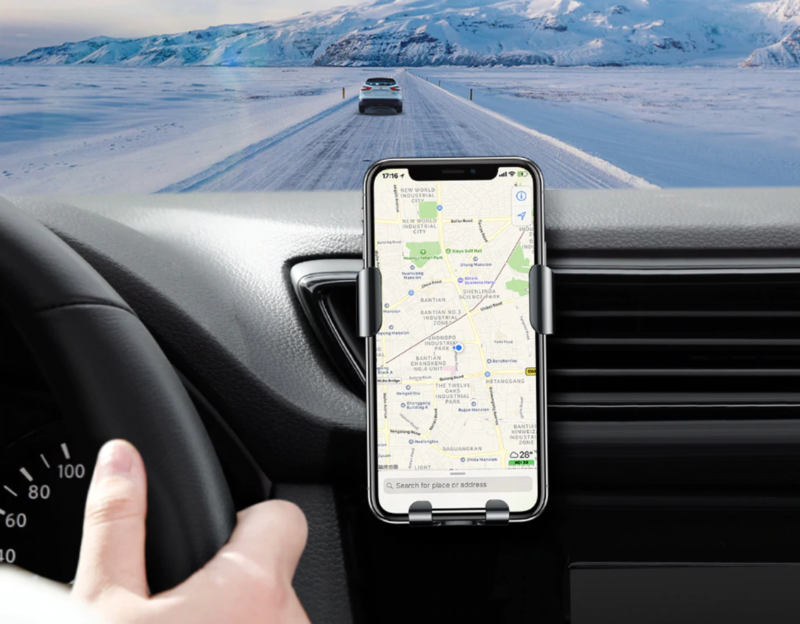 The 360 Degree Windshield Car Mount is a 2-in-1 car mount accessory that can be attached to the windshield, the dashboard and almost any type of air vent. The color scheme screams class and sophistication. You can choose the unobtrusive black option, the classic gray or the flashy white item to mix and match the look and feel of your dashboard. The light blue accent isn’t just for show- the ABS and silicone material is crafted for maximum cushioning and protection for your precious iPhone device. The grip holds your iPhone in position without any danger of slipping or falling when dealing with bumps you may encounter while on the road. 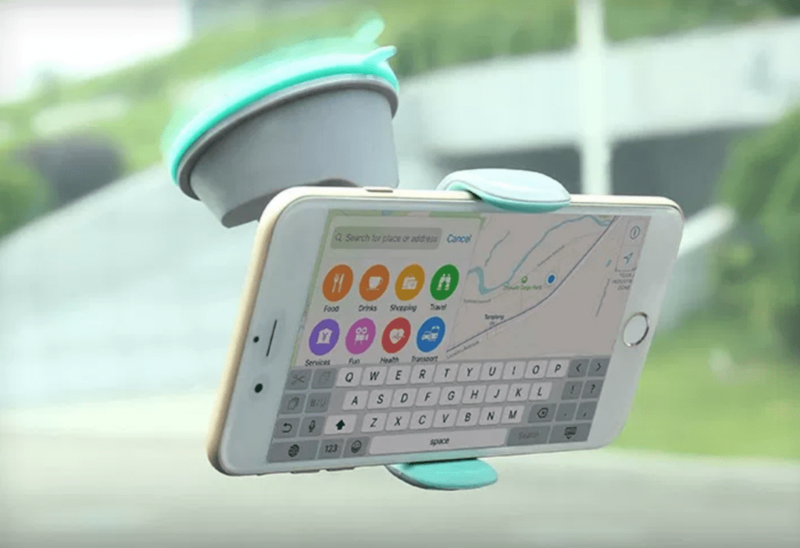 With this iPhone car mount, you can drive and focus on the road while still being able to rely on your device for navigation and calls. 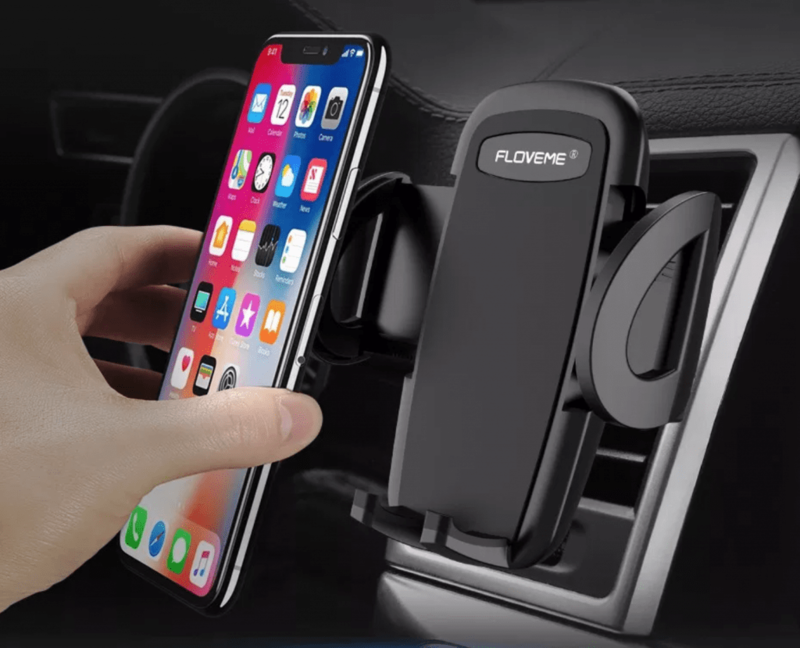 The Universal Air Vent iPhone Car Mount is simply loaded with features and safety designs for total hands-free operation. At the surface, the durable material is made of high-quality ABS, making up most of the holder shell. The air outlet connections have added anti-skid cushions to ensure a snug and secure fit. As for the clamps, they are reinforced with silicone to prevent unnecessary scratches. This mount has a triangle design that holds the base and keeps your iPhone from falling while in use. You can count on the air vent car mount to secure your device as you keep your eyes on the road. There’s a handy one-click release button for times when you need your phone as you step out the vehicle, and last but not the least, a reserve charge port when you have a navigation app open.